When you think of Firestorm foes, characters that typically come to mind include: Killer Frost, Multiplex, Hyena, Typhoon, Plastique, Deathstorm, or maybe even Slipknot. However, in Firestorm’s 34 years he’s faced quite a few other foes. Today we’re starting a new semi-regular feature looking at some of Firestorm’s more unusual opponents. Welcome to the first installment of what I like to call — UNUSUAL SUSPECTS! Right out of the gate I wanted to tackle one of DC’s biggest, baddest villains of all – DARKSEID! Believe it or not, Firestorm has gone toe-to-toe with Darkseid on a few occasions and somehow managed to survive! First up is a scene from Justice League of America #185 (Dec 1980) written by Gerry Conway and drawn by George Perez & Frank McLaughlin. 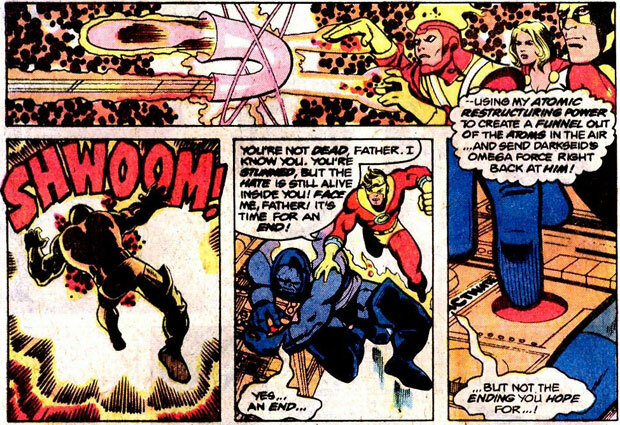 In this scene Firestorm gives Darkseid a taste of his own medicine! Now admittedly, the comic above was published back before Darkseid was THE big bad of the DC Universe. 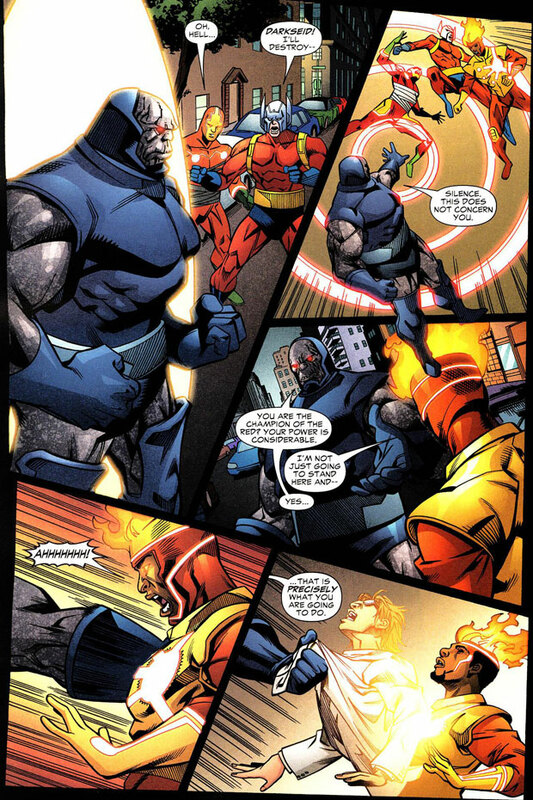 Nowadays, Firestorm probably wouldn’t be able to pull off such a simple stunt against Darkseid. In fact, the next time Firestorm was face-to-face with Darkseid, things went very differently. 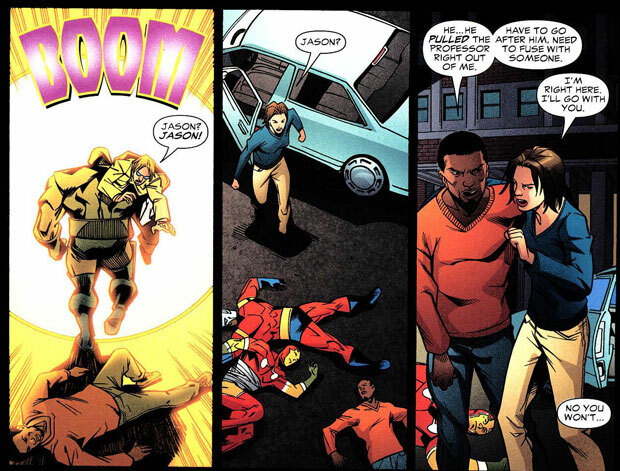 Below is a scene from Firestorm the Nuclear Man vol III #35 (June 2007) written by Dwayne McDuffie and drawn by Pop Mhan & Steve Bird. Yeah, that’s right. Darkseid just showed up and literally ripped Firestorm apart. Wow. That’s serious power! Let’s tally up the two battles… looks like the final scores between Firestorm and Darkseid were: One victory each! I don’t know about you, but I’d gladly accept a tie with Darkseid. Heck, I’d gladly accept just surviving against Darkseid! Watch for more UNUSUAL SUSPECTS in the weeks to come! Posted in: Comic books, Dwayne McDuffie, Firestorm #01: Original (Ronnie/Martin), Firestorm #07: Jason post-Infinite Crisis, Firestorm comic vol. III, George Perez, Gerry Conway, Justice League of America, Unusual Suspects. Well, I’d put my money on Darkseid in ANY match-up, so it’s pretty cool that Firestorm got one(1) victory on his score card. And wow, I’d completely forgotten Orion’s Geo-Force phase. Serious power? Sure. Completely out of nowhere, with no explanation, and shouldn’t have been something even in Darkseid’s skill set? You bet! Nothing more than a lazy way of beginning the long path toward getting rid of Professor Stein by writers who didn’t understand how important he really was? Absolutely! The fun of Firestorm is that I don’t even think he (they) have truly understood just how powerful he really is. Seeing that Darkseid perhaps knows more about that than flametop does is neat, and fitting. I’m hoping you cover Captain Atom in this series. While I was never a huge fan of the Captain, seeing them feud was cool because they were both quite powerful with similarly inspired atomic/nuclear powers. Darkseid is brilliant, and a chessmaster extraordinaire, so yes, it does stand to reason that he might know more about Firestorm than Firestorm doesn’t himself. But I stand by my earlier statement, Darkseid should not have the ability to just reach in and grab a component of the Firestorm matrix. That kind of ability comes out of nowhere, and is not something that Darkseid should be able to do. It’s not a sign of his brilliance, but rather of lazy writing. That Dwayne shined when it came to handling super powers. The really thought theirs physics through. RIP. 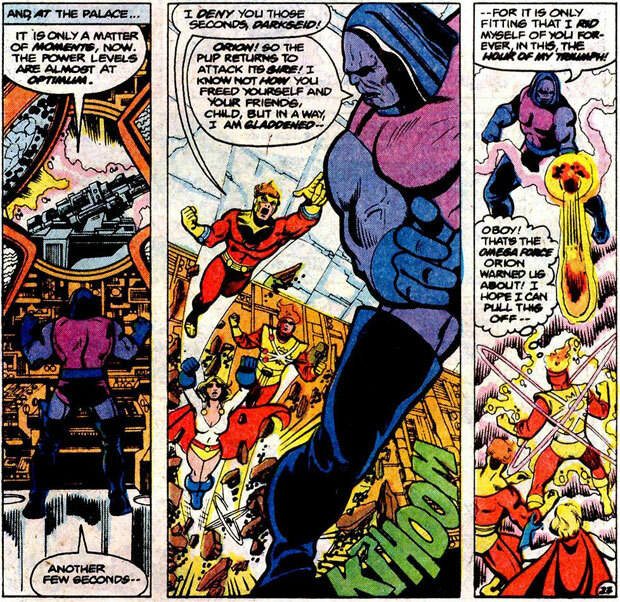 My favorite Darkseid moment with Firestorm was Firestorm: The Nuclear Man #57 & 58, wherein Darkseid, reeling from his losses during Legends, engages in a chess game that results in the Post-Crisis origin for the Parasite. While not taking on Firestorm directly, it’s interesting that of all the heroes he could have picked, Firestorm was the one he chose to engage the new Parasite. If you get around to one of those Captain Atom rows, you know who to call. Thanks for all the comments folks! Much appreciated! I’m glad you like this segment. We’ll be seeing more like this in the near future! The second Darkseid encounter really served as a teaser for DC’s event called “Countdown”. I’d be interested in Unusual Suspects as a blogover too… though the SBG’s general focus doesn’t necessarily bring anything to mind. I don’t know that Darkseid being able to pull the professor out of Jason bothers me that much. In a world of superheroes with awesome powers, being a “god” has to mean something— like being able to do *almost* anything. If being a “god” actually meant that kind of undefined power in the past, you might have something. But it didn’t at any point before then. While the New Gods (of which Darkseid was a member) did indeed have awesome levels of power, those powers were always within reasonably well-defined fields of influence. This ensured that the various members of the New Gods were not all clones of each other, and that there were actually struggles to be fought and goals to be reached. To put it short, it’s what makes storytelling work. Well, you know who can *always* beat Darkseid? Slipknot. That’s who. I love early Perez, and early Perez Firestorm ..he had such a good look.